Eight Days to Amish: Audio rights for "Use ALL The Crayons?" Sold! Audio rights for "Use ALL The Crayons?" Sold! Confirmation of the surreal news arrived in the mail early this week. 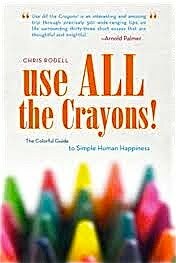 My book, “Use All The Crayons!” is being made into an audio book. The letter said a check would be forthcoming and it would be sizable enough to forestall my perceived Amish destiny for another few days. And a mind that does more boggling than perceptive thinking went into boggle overdrive. I think having Streisand reading my book aloud would bring fresh interest in a book I’m starting to suspect has a chance to be a real self-publishing success. Evidence of this comes from a bona fide publisher that’s expressing a preliminary interest in taking the title for themselves. This would give me huge distribution and promotional advantages I couldn’t achieve on my own. I do this because, first of all, I believe in the book. The more eyeballs that see it, the more mouths that will talk about it. This is turning out to be the case. People are loving “Crayons” and telling friends about it. Secondly, I believe people instinctively respond to kind gestures with reciprocal kindness. Many people are buying additional copies for friends and loved ones. Really, it makes a great gift to someone you love or for someone who’s helped add joyful colors to your life. This is confirmed every time I open my little office refrigerator. To the door and sides I’ve taped more than a dozen letters beautiful enough to charm away all my blues. They are from old friends, new ones, interested strangers and hardship cases who say they can’t afford a book, but somehow believe the book will help brighten their days. The most touching of these is from an Illinois woman who read on the web that a guy was giving away for free a book about happiness. “Karen T. is my 66-year-old sister is in a nursing home following amputation of her legs due to complications of diabetes. This comes on top of losing her son a bit over a year ago. He took his life five hours after our mother died. He had been one of Mom’s primary caregivers and we can only assume her death was more than he could handle. “If anyone needs a pick-me-up to brighten her days, it is Karen. Her prospects of being able to get home in August (when her Medicare benefits run out), don’t look good. I am not confident that her family will be able/willing to take care of her at home. Man, that’s a lot of pressure for one little book. So instead of the book, I sent her a case of bourbon. And don’t even think of it, my dear boozy friends. Offer applies only to relentlessly grieving diabetic paraplegics whose Medicare benefits expire right . . . now. Actually, I did send her a book and said a prayer. I haven’t heard how it worked out, but if my book causes her legs to grow back I believe an hour with Oprah is in my future. But last week I got one that’s even better. Beautiful, actually. It’s from Helen G.
“Dear Mr. Rodell, I can’t tell you how much I’m enjoying your book. I have very painful arthritis in both knees and suffer from a host of other health problems. Some days I get very depressed. Since reading your book, I realize I’ve only been using two very dark colors. She’s 97. That’s right, 97! Her letter makes me chagrined I didn’t write this crayon book back when I was using actual crayons to do all my writing. So I think we’re on to something here. Want to help? Just keep doing what you’re doing. I asked anyone who received book to in exchange think momentary positive thoughts about me and the book. I think it’s working. Buy if you feel like it. Tell your friends if it comes to mind. Instigate a book store stampede via social media if you’re feeling anarchic. But I think we’re on the right track. If you really, truly, feel like doing something beneficial, then how about this? Say a prayer for someone like Karen T.
Congrats, Chris, on the audio book deal. That's great news for a deserving book. If the Barbra thing falls through, I'm available. I know at least three people that would be interested in hearing me read your book. In fact, I might read it to them anyway, just for fun. I'll take it, Joe! Who says we only need one voice? Thanks so much for your kind words. I'm especially pleased to hear your eagerness to share the book with friends. That gives me confidence we're really onto something. Happy 100th Birthday Gene Kelly! Why no statue? I turned 50 & no one noticed, me included! How come Olympic gymnasts rarely smile?